On a steamy summer's night, the sounds and smells are of Africa. Hawkers grill meat on fires built inside shopping trolleys. 'Burrha! Burrha!,' they shout, holding bags of counterfeit Marlboro cigarettes. The reason for all this activity — in an area which even the most optimistic estate agent would struggle to sell as 'cosmopolitan and bohemian' — is quite simple: immigration on a mammoth scale. Recently, it was reported that this sprawling district now holds as many as 300,000 illegal immigrants, many of whom rely on crime or the 'black economy' to make money. 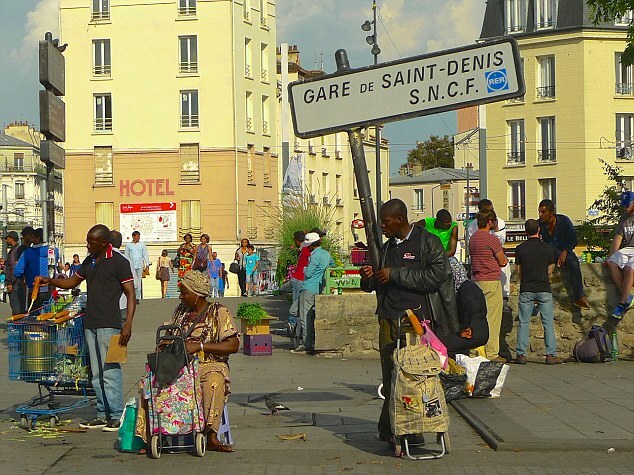 The official legal population in Saint-Denis is estimated at 1.5 million. Not only that, according to French parliamentarians in a new report that's causing much anguish across the nation, as many as 420,000 legal residents here are living 'below the official poverty line'. 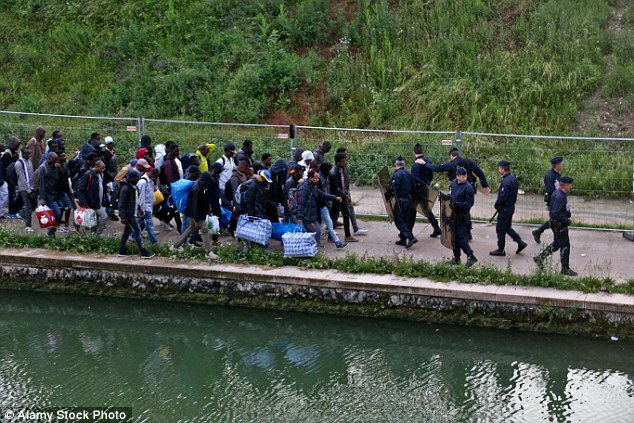 Migrant camps, set up in tents along the Seine in this area of Paris, were destroyed by the police in May, with the occupants who didn't get away taken for processing in detention centres after a raid. Bon chance, monsieur — as they don't say in this teeming quarter, where speaking Arabic is more useful than French. Here, I saw a woman walking in full face veil — illegal under a French law introduced to promote integration. No one batted an eye. Another pushed him away and pretended to fire a shoulder-mounted missile, tracing the missile with his hand towards its targets and shouting: 'Boom!' Everyone laughed. Police have reportedly admitted the area is a 'no-go' zone, and will only drive through the areas armed and four to a vehicle. Meanwhile, politicians on the Left try to deny the problems: Anne Hidalgo, Socialist Mayor of Paris, announced she was going to sue Fox News, the Trump-supporting Right-wing U.S. TV channel, for claiming that there were 'no-go areas' open only to Muslims. 'The police had no idea who anyone was, and were pretty much shooting on sight because everyone was a suspect,' a local who witnessed the raid told me. At the time, Manuel Valls, the prime minister, spoke of a 'geographical, social and ethnic apartheid' and that 'these last few days have underlined a lot of evil that is gnawing at our country'. There are around 350 known jihadists living in Saint-Denis, while 1,700 are believed to have returned to France after fighting for IS in Syria, with 15,000 terrorism suspects in France.In Saint-Denis itself, there is a record number of mosques — 160 official ones, and many more unofficial — compared with 117 Catholic churches and 60 Protestant. Yet it is the unauthorised mosques — set up in basements and garages — that the authorities fear the most. 'The radicalisers use these hidden places of worship to influence the young and impressionable,' said a veteran police officer who has worked in Saint-Denis for more than two decades. A chunky character in a red Ellesse sports shirt, he was relaxed, smiled at me and said politely to me in English: 'No — go.' I went. Most blocks seemed to have the same operation, with youths guarding the front doors, 'spotters' on the streets opposite for signs of police or other gangs, and the drugs held and sold inside. He's since watched other Jews flee the area, and his dying father begged him to leave before it was too late. He came down to speak to me, but declined my invitation to stroll around the streets. 'The problem is people coming to France and wanting to change it. And it's worse because they want to force people to change. I know I look different. The hatred is obvious — people spit when you walk past. 'I respect this country because I was born here. I respect the laws of this country. I respect Christmas even though it has nothing to do with being a Jew. 'Now they won't let Christmas happen. France has existed for thousands of years. If I didn't like those laws, I would move to another country. Two men in their 20s have been charged with her murder, one of whom Mrs Knoll's family say was a Muslim neighbour they had known since he was a boy. While only a few hundred attend weekly mass at the Basilica here, thousands of Muslims stream into the area's mosques for Friday prayers — so much so that, in a rare intervention, the authorities banned them from praying in the streets as well. Women suffer the most. Not far from the drug dealers outside the station, I visited a women's refuge set up by Ghada Hatem, a senior gynaecologist, who says almost one in five of her patients have been victims of female genital mutilation (FGM) — the barbaric ritual of cutting the sexual organs of young women. Now a specialist in the repair of such intimate mutilation, Hatem, who hails from Lebanon, says she is in daily contact with 'women who tell me about the horrors they experience at home'. Yasser Louati of CCIF (Group Combating Islamophobia in France) said attacks and harassment of innocent Muslim communities had 'risen considerably since the terrorist attacks', even though many of the victims of the 2015 Paris outrage were Muslims. Mosques have been firebombed, and Muslim centres daubed with pigs' blood. New powers for the security services make house searches and arrest easier, especially when suspects are targeted because of their 'physical [Arab] appearance', said Mr Louati. One group I met comprised migrants trying to reach Britain who told me they were originally from countries such as Pakistan, Bangladesh and Ghana, which may be troubled but are hardly war-torn. I also met men from Afghanistan. Moliner, an author on Islam, stated: 'We can never convert the 30 per cent of Muslims who demand the introduction of sharia law to the merits of our democracy and secularism. As well as recommending that €5 billion be spent, he stressed the need for 'national reconciliation', especially in districts facing up to the withdrawal of French identity and community, which in turn fuels xenophobia. The simplest way to accelerate this cultural conquest madness is by sheepishly claiming the governments are powerless to stop it. Really? Does this mean I can move to any country I want with 10,000 unemployed pals and just take over- forcing out the locals in the process? How many minutes would that last until the military was called out? Do France, Italy, Spain, and Germany have no military forces to repel foreign invaders?